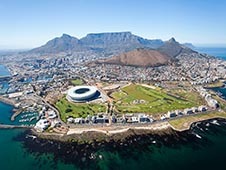 Cape Town – a city located in South Africa, near the Cape of Good Hope. Cape Town, at any time ready to meet with the tourists: the main street called Long Street is filled with restaurants, shops, trendy boutiques, bars. If you dream of a beach holiday and surfing, then Cape Town – one of the best places for the realization of these desires. Here you can get a cheap surf lessons from experienced coaches. Professional surfers can go to the local reefs. Shops and markets of the city offer the opportunity to acquire the traditional or original souvenirs. The main attractions of Cape Town should include the fortress of Good Nadezhdey, St. George's Houses of Parliament. Travel around the city on a personal rented car at the airport in Cape Town. You can order the service online bookingcar.ru. To determine whether you can turn right at the crossroads, look for the arrow lights: If it lights, the turn is allowed. For the majority of parking in Cape Town need to pay. The cost of parking is determined by various factors: the remoteness from the city center, for example. Parking is paid hourly, the average price of 02.04 rand. Multi-storey parking lots are more expensive - about 5 rand. Self parking is absent on paid - for all drivers will valet dressed in bright jackets. The maximum speed limit for the highway is 120 km / h.
Observe additional guidance in the form of traffic signs and signals. Near a busy city road and track long-distance destination contains many gas stations that operate around the clock. When they are often open small shops with goods of prime necessity for motorists (food, drinks, etc.). diesel fuel - $ 0.95.